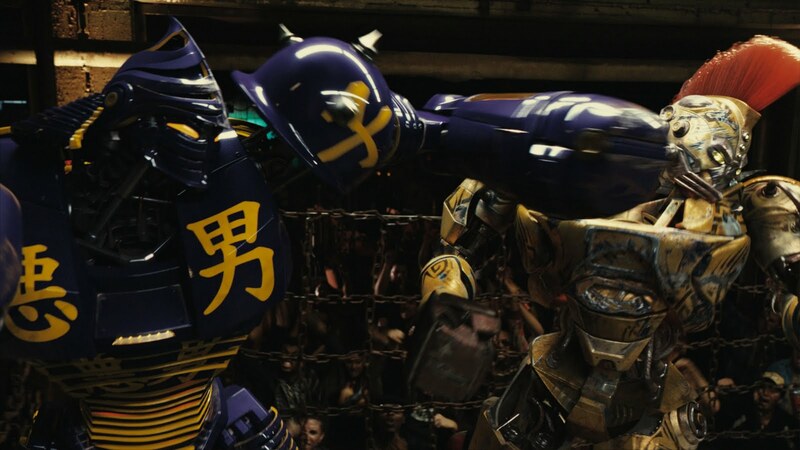 MY CALL: The fights may lack the technical delight we see from Scott Adkins (Assassination Games; Undisputed II) or Michael Jai White (Undisputed II, Never Back Down 2: The Beatdown), but with Sugar Ray Leonard’s choreography these fights are some good, old-fashioned bot brawler fun. I give this an unexpected B+. IF YOU LIKE THIS, WATCH: Not much like this, but this reminds me of Robot Jox (1990), a low budgeter sci-fi for the superfans out there. SIDEBAR: I stick more to the story while Marko provided a detailed critique of the moviemakers and production of Real Steel. Check it out. 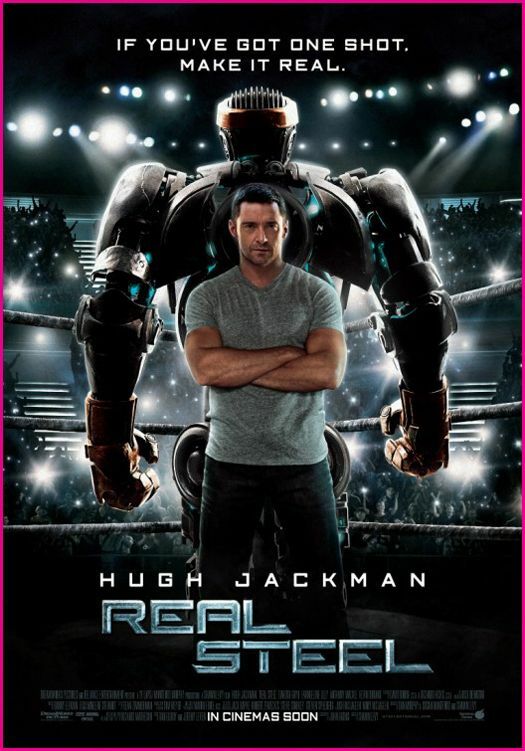 In the not-too-distant future (2027) Charlie Kenton (Hugh Jackman; X-Men, The Prestige) plays a down on his luck, scheming ex-boxer who signed away the rights to his son at birth, owes every unsavory soul he could find some money, is behind on his rent, and even more behind on his dignity. He’s down on himself so much that he won’t even tolerate hearing accolades of his past triumphs. Charlie pushes everyone away so far and hard that he can’t even remember how old his own son is (who is 11). The ultimate scumbag, Charlie sells custody of his son (Max, played by Dakota Goya; Thor). But to collect, he must spend the summer with him. 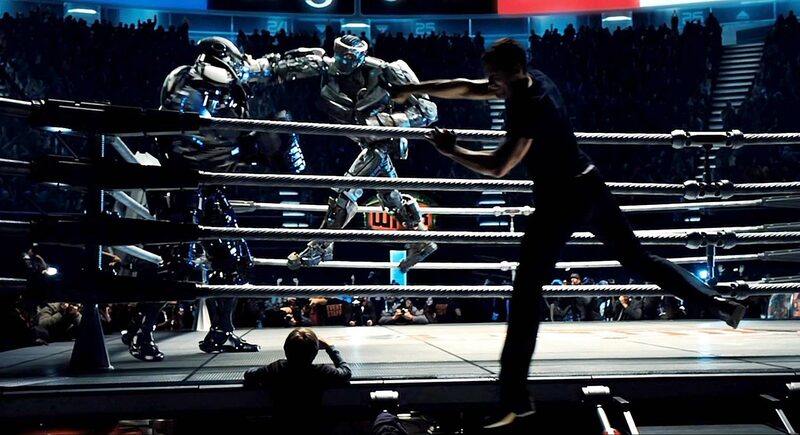 He uses the $50K custodial bounty to buy an ex-pro robot boxer to pit in a dirty underground fight. Guess how that turns out for this winner? 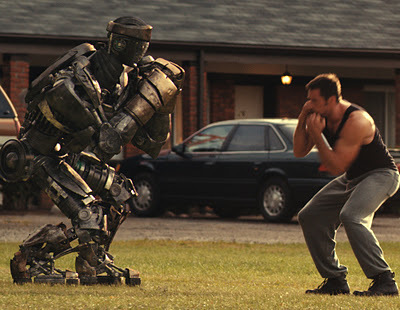 Charlie teaches Max about haste, greed, theft, and the history of sport-fighting that led to the robot boxing sensation. 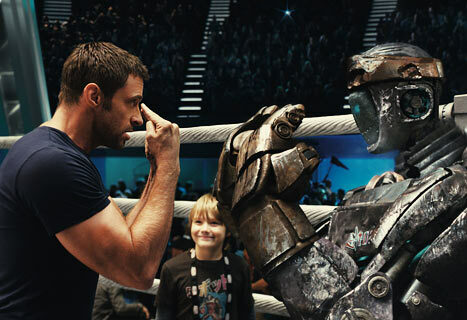 Max, a fan of robot boxing, teaches him how to dream with his devout support of an obsolete model junkyard robot. Because Max won’t let up, Charlie has no choice but to submit and teach him about the sport. “You’ve played video games, right? Well this is just like that. 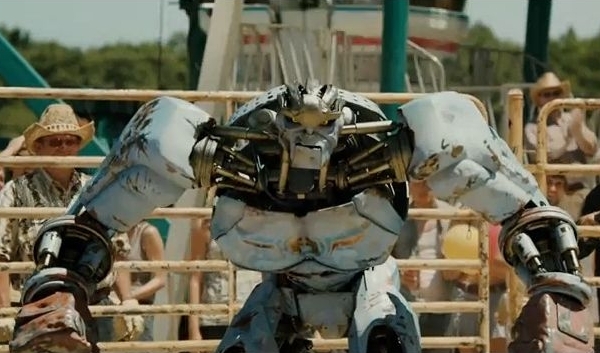 Except that this one’s a 1000 pound robot.” Atom, as Max names him, is a sparring bot that mirrors fighting styles. Atom is under-sized, fast and designed to take hits, not deliver them. Charlie has doubts. Max has dreams. And Atom is special. Charlie teaches Max what the audience wants and trains the bot to box. Max works up a mean robot shadow-dancing routine to give Atom a persona. Atom serves as a friend to the boy and an inspiration to both of them. This makes Charlie smile for reasons beyond money. When he sees Max win with Atom, it’s as if Charlie begins to think he can, too. They quickly beat some big names and make one for themselves and go pro aiming for Zeus, the pro-champ and an evolving, fully autonomous robot. How do you beat that? For the boxing enthusiasts out there, Sugar Ray Leonard sets up an original rope-a-dope for our junkyard scrapper in honor of Muhammad Ali. 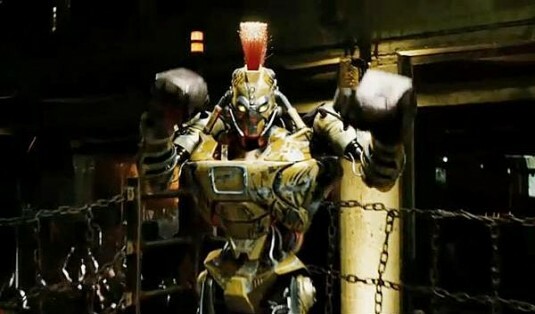 In Real Steel, Atom may lack the palpable emotional output of Wall-E, but this faceless robot manages to make us “feel”. And it may not quite be Rocky, but when Atom wins, I feel like “I win.” This father-son team and junkyard robot turned hero really made my day! The hits are hard, the drive is contagious, and the victory is emotional!